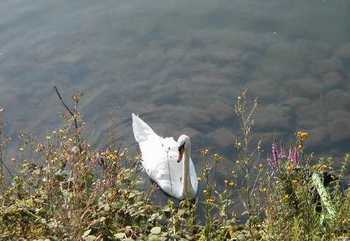 For the first time, I actually saw a swan (cygne) by the Allee des Cygnes during my morning walk yesterday. 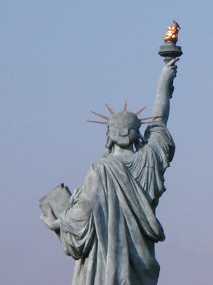 That same morning, a palombe (aka wood pigeon, pigeon ramier, ring dove) sat atop Liberty's torch. 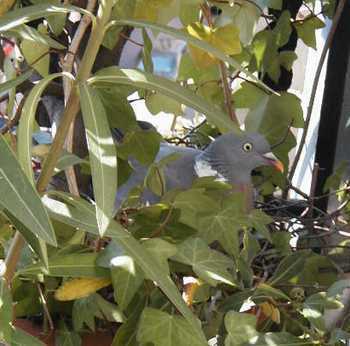 This wood pigeon is nesting out on our balcony, at the base of a bay tree, not more than three feet from where I now sit. She's always there, and I've not been able to water the bay tree yet. For more about these birds, see June 25, 2003, journal entry. One of the papers said people complain that Paris lacks conviviality and creativity. I won't attempt to address the creativity issue, but conviviality? This is a downright convivial place. We don't even have to leave the apartment and conviviality drifts up from the street and permeates our space. Frequently, a four-piece brass band strolls down our street (and this isn't a tourist area) on their way to the rue du Commerce. They play well, so people throw money down at them from apartments like ours. We're up so high that we have to do this very carefully. There are no paper 1 euro notes, only coins. I thought of making a paper airplane out of a 5 euro note, but that seems to be overly generous. On our way home from dinner at Oh! Duo last night, we happened upon a 3 piece jazz band playing in the little used and sparse Place Emile Zola (intersection of Avenue Emile Zola and rue du Theatre). They were just there to play. There was no hat or open music case in which to toss coins. The players appeared to be quite prosperous. They keyboardist had a long extension cord strung from his instrument, across the street, into an optical shop. I guess they're just neighbors who are getting together to jam in the Place instead of in one of their apartments. At any rate, they are talented. Today I had to go to the not so good bakery across the street because our regular one (Au Pain Naturelle, rue Fondary) is closed on Wednesdays. Madame at the not so good bakery is usually fairly glum. But today her face lit up (more conviviality) when she saw my Kerry button. We had a nice conversation, in French, in which we both agreed that Kerry should win, Bush is to be detested, Clinton is a magnificent man, and we're both going to buy Clinton's book and read it. The French newspapers have had LOTS of coverage of the Democratic convention in Boston. This did not happen in 2000. One of the papers said that never before has Europe been so preoccupied with an American election. Today I went to Darty to try to buy a router so both computers can be connected to the internet at the same time. They only carried wireless ones, so I asked where I could find a non-wireless one. The young man very nicely told me to try FNAC. On Blvd. St. Germain, I asked? Yes. Merci, monsieur. And off I went on the metro to FNAC, which is obviously the place where people buy computer and AV stuff in Paris. Cool, air conditioned, big sleek store. Darty is going to go out of business, I'm afraid.